Australian Kate Webb was one of the first reporters to reach the US Embassy in Saigon during the Tet offensive and became UPI bureau chief for Cambodia in 1970, before being captured by North Vietnamese troops. Le Ly Hayslip enjoyed a peaceful early childhood in the Vietnamese farming village of Ky La before war changed her life forever. Brutalized by all sides, she escaped to the United States, where she eventually founded two humanitarian organizations. Lynda Van Devanter was an idealistic young nurse in 1969 when a plane carrying her and 350 men landed into South Vietnam. Her harrowing and often disillusioning experiences working in a combat zone hospital there would later serve as inspiration for the TV series China Beach. 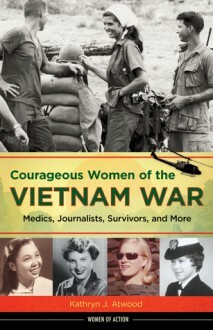 In Courageous Women of the Vietnam War, readers meet these and other courageous women and girls who risked their lives through their involvement in the conflict in Vietnam. These women served in dangerous roles as medics, journalists, resisters, and revolutionaries. Through their varied experiences and perspectives, young readers gain insight into the many facets of this tragic and complex conflict. Author Kathryn J. Atwood provides appropriate context and framing for teens to grapple with the harsh realities of war.